Here comes the good news for all the UGC NET 2019 Aspirants! The NTA will soon conduct UGC NET June 2019 Exam. Likewise, the previous years, the official authority would not be CBSE nor UGC, as NTA has taken over the charges of exam convener body. The exam will be held at 263 UGC NET Exam Centers. While filling up the application form, the candidates have to enter total 4 preferences of their desired UGC NET Exam Centre Code with Subject Code. 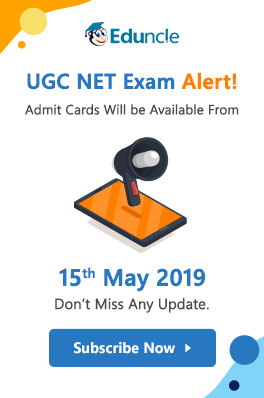 And later, during the allotment of UGC NET Admit Card, the exam convener authorities assign candidates one of the NET Exam 2019 Centers based on their preferences and locations. To help you choose the right one, we have come up with the List of UGC NET Centre along with their codes in this blog below. Crack UGC NET in 1st Attempt. Try the Sample Study Material designed by Eduncle Experts for Free. For the ease of students, we have differentiated the UGC NET Exam Centre 2019 based on their States. So, let’s explore the below lists and find out the UGC NET Center at your nearby location. Also, use its associated code to fill in the UGC NET 2019 Application Form. Here is the list of NET Centers located in various states/union territories in India. The exam governing body made conscious efforts to allot the desired center to the candidates for their convenience. Although in case of an emergency there may be any deviation while allotting the chosen UGC NET Exam Centre 2019. Do you want to stay updated with every single news and releases of National Eligibility Test? Check recent UGC NET Notification here and keep visiting the page regularly. In case, if you face any problem in understanding the form filling procedure or submitting it or analyzing your eligibility or any other issue, please let us know in the comments’ box below. Our Experts’ Team will help you out with the best way possible. How to Study for UGC NET 2019?